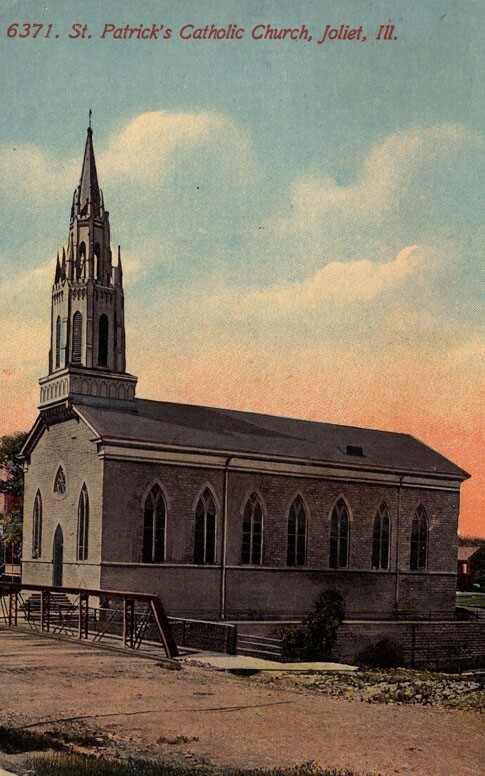 The History of St. Patrick’s Church dates back to 1838 with the arrival of the Reverend John Francis Plunkett, an Irish immigrant who came in answer to the call of the dying canal workers during the malaria epidemic of 1838. Father Plunkett was appointed the first pastor of the future St. Patrick’s Church by Bishop Simon Bruté of Vincennes (now Indianapolis), Indiana. With the building of the I&M Canal, many immigrant families had come to the area, most of whom were Catholic and many came from the Emerald Isle. As the community grew, Father Plunkett began construction of a new church on Broadway Street just west of the Canal and south of Jefferson Street. Thus was born St. Patrick Church, the oldest Roman Catholic Church in the Diocese of Joliet and the second oldest in the whole Metropolitan Chicago area. It is now considered a landmark of Joliet. During the next 175 years and seventeen pastors later, St. Patrick Church has flourished and experienced many changes. Our longest serving pastor came from Tipperary, Ireland in 1917, Rt. Msgr. Philip L. Kennedy. Upon his arrival, Msgr. Kennedy erected a new St. Patrick’s Church, School and Rectory. The first Mass was offered in the new church on Sunday, March 2, 1919. Msgr. Kennedy served St. Patrick’s from 1917 until the time of his passing in 1961. At the closing of our school in 2011, St. Patrick’s has refocused itself back on its immigrant roots, not only serving those long-established parishioners who can trace their lineage back to the early years of the parish’s history but those new to the area from foreign countries who wish to receive spiritual assistance while providing for their families. To quote Pope Francis, St. Patrick’s Church of 2013 truly is “The Church of the Poor” in both flesh and the spirit, made up of a immigrant population from throughout the world. It truly is our pleasure and honor to serve all of them, namely all of us, pillars and neophytes to the parish, in the name of the Lord.